Energy Conservation Tips. Ideas for ways to save energy and money. Energy Conservation Tips that result in serious home energy savings. Many of our energy saving tips are free to implement and others cost so little that you'll make the money back in less than a year. There are some, like pv solar energy, that have a substantial price tag and will take longer to pay you back (although they start paying the planet back immediately). We have tons of ways to save energy and cost cutters that you can live with in comfort! Nations around the world are encouraging us to make greener choices and will even help with the initial expense of some of these changes. If you're a US Resident, check for state and federal incentives	at dsireusa to learn how you can save money being green. Energy cost cutters and environmentally responsible techniques for using less... painlessly. Eat by candlelight occasionally, especially in winter when the nights start early - even the kids like it. Slow cookers, electric fry pans and electric kettles use less power than the stove top or oven. Use the toaster oven for baking, roasting and broiling small items rather than heating the big oven. The funny thing about toaster ovens is that although they're great for some things... toasting isn't one of them. They use way to much energy heating up the entire box when all you really want it to heat up is the bread. A slotted toaster is more economical for making toast than a toaster oven. 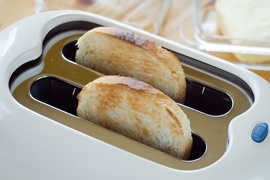 The toaster snugs those hot coils right up against the bread, efficiently toasting without throwing off a lot of heat. Make a solar oven with the kids or grandkids and use it. It's Fun and Educational. When appliances need to be replaced, buy the most energy efficient ones on the market. From most to least these are the appliances that use the most energy: Refrigerator, electric oven, central air conditioning, freezer, washing machine, dryer, electric stovetop and dishwasher. When using the stovetop, select a pot or pan that is sized appropriately for the burner. A small pot should be placed on a small burner. Front loading washers use less power, water and detergent and any appliance that displays the energy star logo has been proven in the energy conservation department. (studies show that hot water has little benefit over cold). 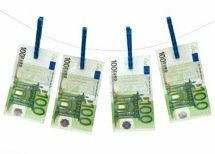 Launder only full loads or select a cycle for small loads. Use the cool cycle as much as possible on your dryer. Add dryer balls (tennis balls will work) to dryer loads to keep the clothes fluffed and reduce drying time. 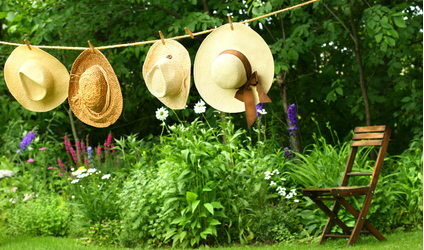 Install a clothes line (a passive solar power clothes dryer). Not only will it reduce your power bill but the sun bleaches your sheets and cottons to a crisp white and no chemical product can imitate the fragrance. Use scented candles in rooms on dark evenings instead of leaving a light on. Turn lights off in unused rooms. Installing a solar motion sensor light outside will ensure safe passage for your family and guests while discouraging intruders. When needed, change all difficult-to-change bulbs - entryways and vaulted areas - to LED Light Bulbs. You won't have to do it again for over 20 years. Change your 3 most used light bulbs to LED lights and the others to fluorescent (curly) bulbs). Use LED or fluorescent light bulbs in all light fixtures. Although more expensive ($15 to $35), LED's have a long life expectancy, contain no mercury and use less than a tenth the energy a 60 watt incandescent bulb would use. It takes 5 to 7 years for an LED bulb to pay for itself but it'll last an average of 22 years. It would cost well over $100.00 to buy incandescent bulbs to last 22 years and you'd spend 10 times the amount in energy. A good portion of your energy bill is from heating - whether it's water or rooms, generating heat requires a great deal of energy. Insulate, insulate, insulate. Residential home insulation is the most powerful step toward energy efficiency. Check weather stripping around windows and doors and replace any that's thin or deteriorating. Turn your thermostat down by 2 degrees in the winter and wear a sweater and slippers (up by 2 degrees in the summer). Use a programmable thermostat to automatically turn the heat down at bedtime and when the house is unoccupied. It will also turn heat up just before you get up in the morning or return home from work in the evening. Consider installing a solar water heater for home energy savings and environmental sustainability. Tankless water heaters heat the water as you use it rather than keeping a tank of water hot all the time. Programmable water heaters (much like the thermostat control), heat water only when it's being used rather than keeping it hot all day and night. Don't heat and air condition rooms that are not in immediate use. Close doors and heat registers in unused rooms. Same with air conditioning, only heat or cool the main living area. . When you need those rooms, turn heat or air conditioning on 15 minutes ahead. Seal and insulate heating ducts everywhere you can gain access including basement and attic. Reduce your air conditioning needs by installing ceiling fans and strategically placing fans to keep living area temperatures comfortable. To keep the heat in (or out) Insulate doors, windows, floors, ceilings and walls. A water heater insulation jacket is easy to install, has a rapid payback (usually the first month) and costs between $15 & $25 USD. Keep the hot water thermostat at 110¡ F (43¡ C) for safety and savings. Do a complete green bathroom remodel and increase the value of your home at the same time. Plug your TV and computer into a power bar and switch it off when no one is going to be home and at night. Turning the power bar off when you leave the house is the same as unplugging. The "instant on" feature of television and computer screens uses energy constantly as long as they are plugged in. Laptop computers use much less energy than a desk top. Charge your devices only for as long as needed to gain a full charge. Use a timer at night to stop the charging after 3 or 4 hours. The device will be charged without wasting power by charging all night. Not just GREEN but major household cost cutters. Some of our suggestions will take longer to pay for themselves than others. Some start saving you money right away. Place a 1 litre bottle full of water into the toilet tank if you don't have a water saving variety of toilet. This displaces and saves at least a litre of water for every flush. When it comes time to replace the toilet go with the low water (or no water) use varieties. Awnings over south facing windows can reduce the need for air conditioning in summer by keeping temperatures in and around the house several degrees cooler. Air condition and heat only the rooms in use. Close doors and vents to unused rooms. Install a solar roof vent to rid the house of unwanted heat during summer months. Place foil, shiny side out, or a bubble foil insulator (buy a windshield insulator and cut it to size) in unused windows to keep heat outside in summer. Cover unused windows with plastic (specially sold for this purpose) in the winter to reduce heat loss. Use bubble wrap on windows to reduce migration of heat and cold. Use a spray bottle to moisten window and apply bubble wrap that has been cut to fit. Replace windows with super efficient models when you renovate. 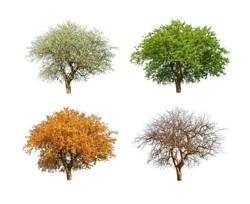 Plant deciduous trees in front of south facing windows. In winter the naked branches allow the sun to warm the house and the leaves in summer provide shade. Plan your errand runs. When you're using the car to run errands, do them all on the same run. Pick up a friend and do the errands together. Plan the stops you'll make - post office, bank, farmers market, grocery store, to avoid a lot of driving. Pick up the groceries last. Every time you start the car, make it count. Drive less and walk, cycle or use public transportation more. Carpool more often and save not only on fuel and maintenance, but on parking as well. Consuming local products and foods saves fuel and the environment (transportation), and supports local business. Recycling and reusing saves energy and resources. 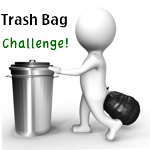 Use sturdy fabric, reuseable, washable bags to carry groceries. Keep them in the car. There are lots of simple ways to save energy and go a little greener at home. 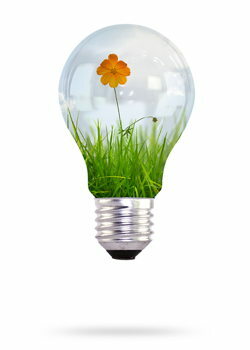 Implementing any of our energy conservation tips will have a positive effect on our planet. Visitors to our Energy Conservation Tips page may also be interested in these pages.